Get industrial style lighting to enhance commercial exteriors with the charming 16" Barn Light Gooseneck made from durable aluminum. This Barn Light Shade and gooseneck arm combination is constructed out of commercial-grade aluminum with a rust-free powder coated finish. And more than 20 attractive color options help customers to achieve the custom look they want. Barn light shades may be inspired by rustic fixtures of the past, but commercial goosenecks are all modern in terms of function. Standard lamping is incandescent wired for 200W maximum service and each gooseneck light is UL Listed. Mounting plates are also cast aluminum, powder coated to match the rest of the fixture. 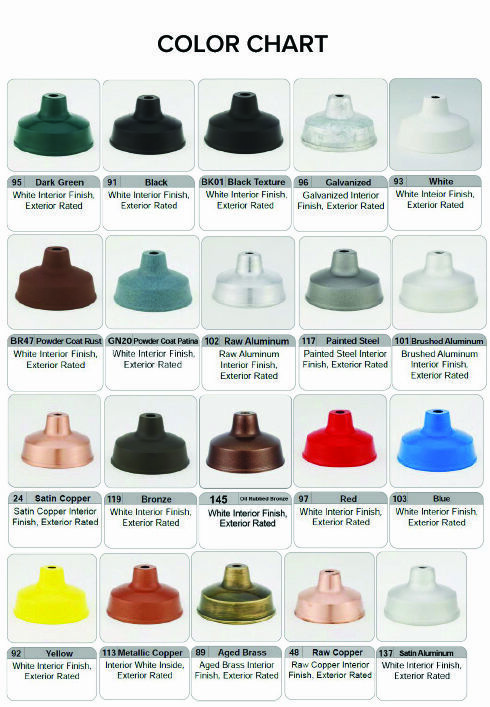 Use to install along standard 4" round or octagon junction boxes. For accessories and non-standard lamping not featured online, please call for details and a price quote. Goosenecks with LED, compact fluorescent and HID lamping (metal halide or high pressure sodium) are also available; additional charges apply. Make exterior sign and awning lighting work for your project with custom goosenecks from Sign Bracket Store.